Sources claim Duduzane Zuma was present whenever the Guptas’ guests needed to be escorted by the VIP officers. The controversial Gupta family allegedly received protection from the SA police service’s (SAPS) VIP protection services on five separate occasions during the 2010 Fifa World Cup in South Africa. According to a News24 report, the Guptas at the time were hosting Indian billionaire Mukesh Ambani and his family. Sources close to the VIP unit alleged the Guptas may have secured police protection based on a claim that Ambani was a “minister” from India. The revelations have raised questions about the unit’s protection of private businesspeople when it is tasked with protecting Cabinet ministers and other high-ranking South African government officials, foreign dignitaries and other VIPs involved in government affairs. Sources alleged they were ordered to pick up an Indian minister from OR Tambo International Airport after the soccer tournament had kicked off. “We were just told that there is an Indian minister that needed to be escorted. The people were then taken to a house in Saxonwold, which we later learned was a guesthouse owned by one of the Guptas’ companies,” one of the sources was quoted as saying. 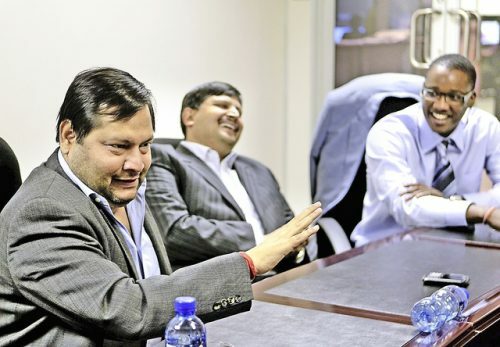 The sources said members of the squad were also ordered to accompany the Guptas and their guests before, during and after the world cup’s final match at Soccer City in Johannesburg in July 2010. Duduzane Zuma and the Gupta brother with a “broad, round face”, according to the sources, were mostly around whenever the Guptas’ guests needed to be escorted by the VIP officers. News24 believes the brother with a “broad, round face” could mostly likely be Ajay Gupta, the elder brother. Among some of the personal escorts cited by sources were to the Lion and Safari Park near Hartbeespoort and to the Grand Central Airport in Midrand, from where the Guptas, their guests and Duduzane flew in a private aircraft to an unknown location.